Maze of Madness is a modern game for an ancient computer (namely the 8-bit BBC Micro, which this blog seems to endlessly bang on about). Well, I say “game”, but it’s more of a demo – a demo of a rather cruel puzzle. But it is actually solvable, if you spot the trick. Mathbrush, the Official Unofficial Historian of IF, said that he’d never come across any other game that uses the gimmick that’s used in MoM. Whether that’s a good thing or a bad thing is not for me to say. Because unfortunately I’m the author. More details about the game can be found at Stardot, at CASA, and at IFDB. Xanadu Adventure is a text adventure game that was written for the BBC Micro by Paul Shave in 1982. Typically for the time, Shave was strongly influenced by Crowther and Woods’s Colossal Cave, and Xanadu therefore featured the requisite stream, grating, and forest-maze… But there was little chance that any jaded adventurers would be bored by these all-too-familiar surroundings because before they could start exploring the game they were forced to go shopping. The game opens with a list of miscellaneous items including weapons, torches, food, and, um, postcards. And each item is given a price. You’re then told that you have “125 shillings to spend”, and it’s up to you to decide exactly how to spend it — although initially you have no idea which of the items are going to be of any use. If for some reason you want a deeper understanding of how Xanadu Adventure can not only amaze and impress but also drive a player to the brink of despair, then see my walkthrough video, above. I have to admit that it might be slightly unfair of me to harp on about the relentless, exhausting unpredictability of Xanadu — because the randomness did actually lead to some interesting emergent behaviour, which I was able to exploit to make my adventuring a little easier: see the “To Catch A Dragon” section of the video, for example, which surprised even the original author. See also the entry for Xanadu at CASA (solutionarchive.com), which links to my written walkthrough (which I now know to be flawed — because Xanadu). There are further details about the game at Stardot. And you can play Xanadu Adventure online at bbcmicro.co.uk. 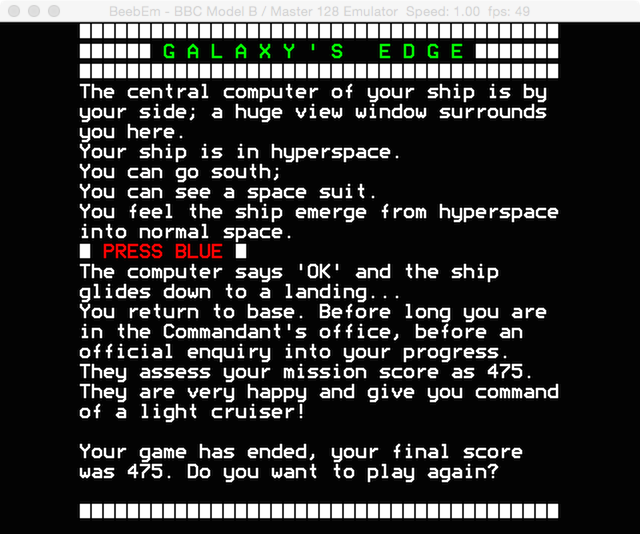 Previously I wrote about The Discovery, which is the first of two works of interactive fiction (known together as Galaxy’s Edge) that were written for the 8-bit BBC Micro in 1984 by Graham Nelson. The Discovery is, more or less, a conventional single-player text adventure game. But the second game, Escape From Solaris, is for two players. It can be played either in split-screen mode on a single BBC Micro, with players taking alternate turns at the keyboard, or, unusually, on two BBC Micros connected together with a serial communications cable (RS-423). I’d been wanting to try to get the game running on two machines for quite a while, and last year I finally got around to it (after taking ages to realise that the way the comms lead had to be wired up was actually rather obvious). See the YouTube video above. Thanks to Lee for letting me borrow his setup and for helping me demo the game. In February 2016, the BBC broadcast a radio documentary about interactive fiction called Skill, Stamina and Luck. It focused largely on gamebooks like Fighting Fantasy, Choose Your Own Adventure, and some interesting historical examples — but it also took in parser fiction (text adventure games) and Twine. To accompany the programme, the BBC created an interesting “interactive audio history of interactive fiction” in the form of a Twine web app, which included a simulation of a play-by-telephone adaptation of a Fighting Fantasy book and many audio clips of interviews, some new and some from the archive, with people like Steve Jackson, Ian Livingstone, Andrea Phillips and Emily Short. The Twine app had been taken down from the BBC website, but it’s now been made available again by Steve Alderton, Content Producer for the BBC Taster pilots. Part 1 of Galaxy’s Edge is a conventional but well constructed adventure in which you roam the stars in the Scout Ship Orion and unravel an intergalactic mystery. 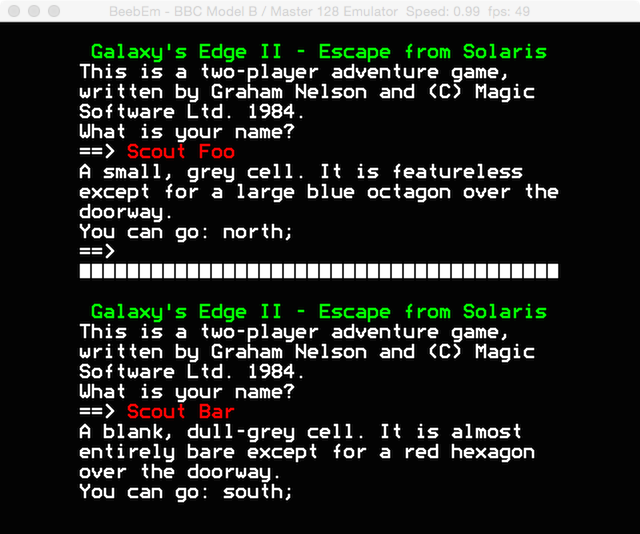 The second part, Escape From Solaris, is an ingenious two-player game which was designed to be run either on a single machine, in split-screen mode, or on two separate BBC Micros connected together by a special cable (the wiring diagram for which now seems to be lost, together with all other original documentation). I don’t think Galaxy’s Edge was available to play or download anywhere till now. I recently grabbed a rare copy of the cassette tape that came up on eBay, and I converted the contents so that the game could be played in a BBC Micro emulator like BeebEm. 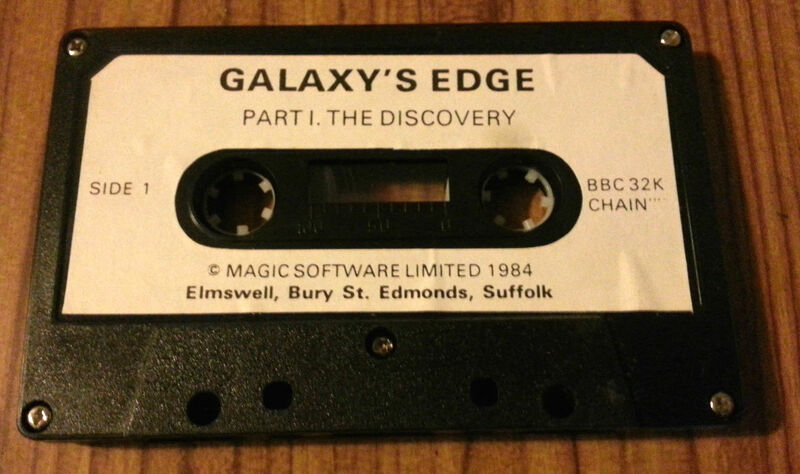 Here’s a link to a BBC Micro disk image containing a transfer of my copy of the game. I’ve played the first part of Galaxy’s Edge – the single-player game The Discovery – and I’ve managed to get promoted, but I know that’s not the best possible result. Can you do better..? The Secret of Arendarvon Castle by Arend Rensink is a text adventure game that was written not just for the BBC Micro but also for the Sinclair Spectrum, the Apple II, the Commodore 64, and the IBM PC. The game was notable for several reasons. Firstly, the fact that there were versions for so many different systems can be explained in part by the way that the game was implemented — as a sort of bytecode. The bytecode ran on a small virtual machine, and there was a different version of the virtual machine for each of the home computers that the game was released for. The “work” that Arend mentions is my cue to talk about the form in which Arendarvon Castle was distributed. As wasn’t uncommon in the 1980s, the game was published in the form of a BASIC program listing in a book, which you were supposed to type in by hand. Yes, that’s right. You were meant to spend hours painstakingly typing and checking and re-checking and cursing and crying your way through the listing till every single line — sometimes hundreds of them — and every single command, string, and colon had been entered into your computer in exactly the same way that it had been printed in the book. And even then, when you were absolutely sure you had corrected your every last typo, the program often wouldn’t work because there had been a printing or typesetting error that hadn’t been caught before the book went to press. Although there was no way to guarantee that a listing would be free of printing errors, Arend Rensink came up with one innovation for Arendarvon Castle that at least made it easier to spot when you yourself had made a mistake: checksums. 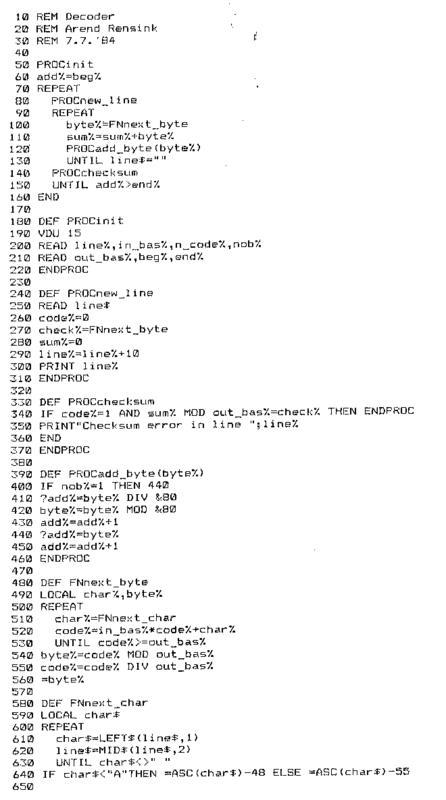 The book included a program that would detect whether the bytecode that you’d typed in, which appears in the listing as long sequences of unintelligible numbers and letters, had an error in it. This was a godsend, which saved you a lot of time and bug-hunting eye-strain, and I can personally attest to that because I used the checksum program when I and another willing scapegoat recently sat down to input the listing into a BBC Micro emulator. Thankfully, we weren’t typing everything in by hand. Arend had already put scans of his whole book online, including the listings, and it was those scans that we initially tried to go by. But they soon proved to be of too low a resolution to be useable. So I contacted Arend and told him of our plight, and he very kindly supplied higher-quality scans of the listings, and even OCRed them for us. The OCRing wasn’t perfect, but it was a start, and, with the help of the checksumming system, the game was soon up and running in BeebEm. 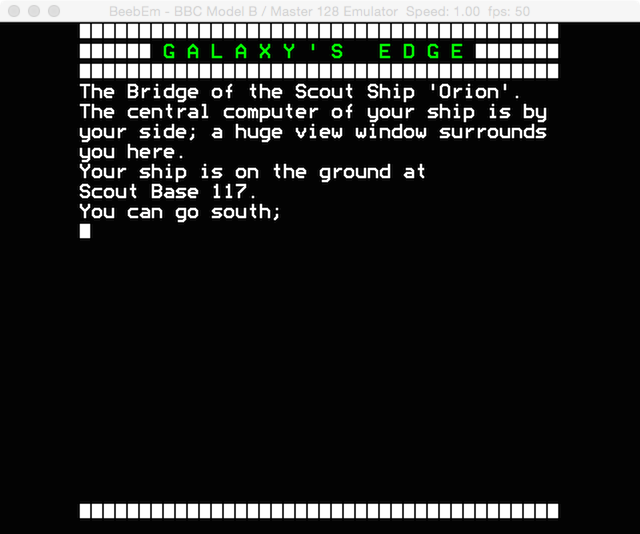 The game is unusual for a text adventure because the player doesn’t use compass directions to navigate her way through the locations in the game, but instead uses the commands LEFT, RIGHT, AHEAD and BACK. So you have to keep reorienting yourself whenever you enter a room. In a conventional text adventure in which you move by going NORTH, SOUTH, EAST and WEST, you can usually go from, say, the South Chamber to the North Chamber by walking north, and then return to the South Chamber by going south. In Arendarvon Castle, you’d make the same round-trip by going AHEAD and then BACK but, on your return, all the exits from the South Chamber would effectively be “reversed”, so that whatever was RIGHT before you left the South Chamber will now be LEFT, and vice versa. This makes for tricky gameplay, although you’d probably get used to it in time. I haven’t had the chance to find out, though, because I always seem to be on the hunt for new old games, and forever distracted from actually sitting down to play any of the ones I’ve already found! But perhaps Jason will add this one to his list of All The Adventures that he’s been playing his way through. 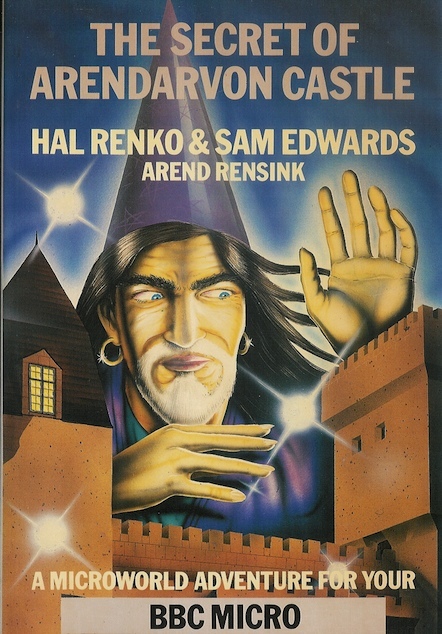 If so, he’d be well advised to download the scans of the book that Arend Rensink intended the player to consult frequently while playing the game, because they contain a lot of supplementary — and in fact essential — material that you’ll need if you want to discover all the castle’s secrets. 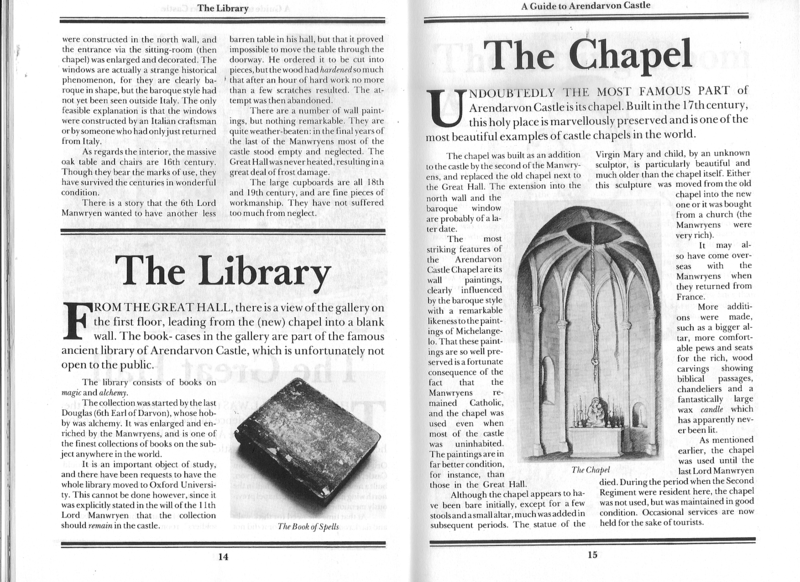 The stories, journal entries, mock newspaper clippings and other documents in the book are the last — but not the least important — reason that The Secret of Arendarvon Castle is a noteworthy entry into the canon of classic text adventure games. The book is lavishly illustrated, by Bert Vanderveen, and the pictures, together with the detail in the accompanying text, conjure up an atmosphere full of occult intrigue that would surely have enticed many a home micro user in the 1980s to take the plunge and start typing in those lines and lines of source code, one character at a time. More details about The Secret of Arendarvon Castle, particularly its authorship, can be found here at CASA, the Classic Adventure Solutions Archive. 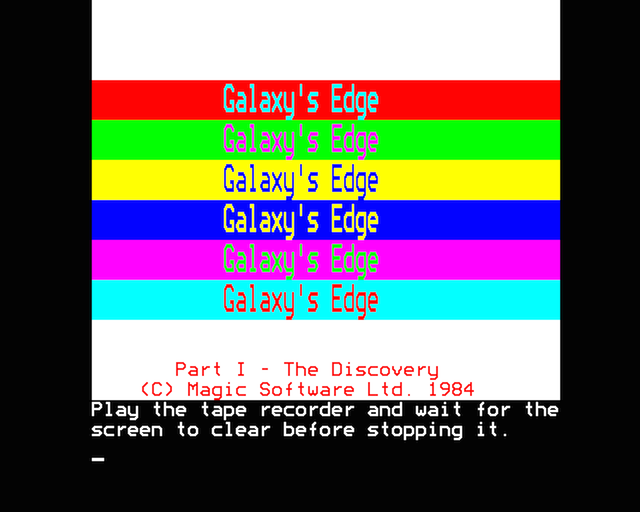 A disc image of the game suitable for loading into BeebEm, the BBC Micro emulator, is available here. 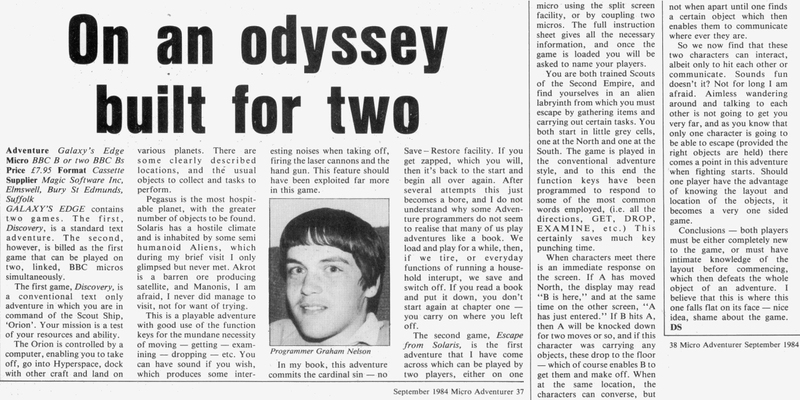 Previously I wrote about Wander, the 1974 mainframe text adventure game-creation system by Peter Langston, which was recently rediscovered. You can now play Wander online. This em-dosbox repackaging of a DOS port of Wander was created by me, using blunt instruments. (I broke the SAVE and RESTORE commands, for example.) Please contact me if you know how to improve my rather crude hack. Which came first? Wander or ADVENT? 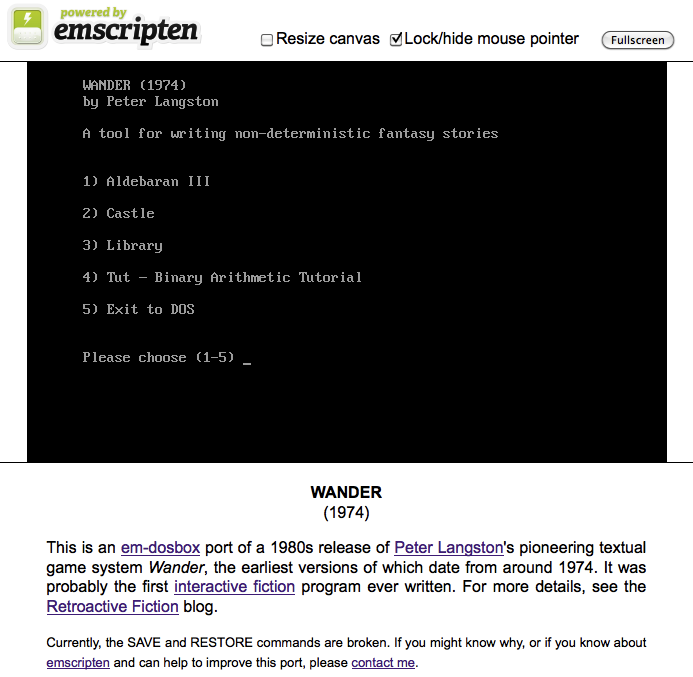 But the very first versions of Wander – which are still lost – date from 1974 or earlier, so you can’t help asking yourself (or at least I can’t) if Wander might have been an influence on the development of ADVENT, which was always thought to be the first work of interactive fiction on a computer. Was Wander distributed widely enough for Will Crowther and/or Don Woods to have had the opportunity to see it before they wrote ADVENT? If the answer is no, then that does that mean there’s something fishy going on? Surely two people couldn’t independently have come up with the idea of a textual game of exploration where you navigate using compass directions? Um, why not? What else would you use, if not NORTH, SOUTH, EAST and WEST? Well, actually, you might use LEFT, RIGHT, FORWARD and BACK – and there is at least one game that does: The Secret of Arendarvon Castle (of which more later). Okay, so it is possible to make a text adventure game with a different set of navigational commands, but compass directions are probably easier for the player to use and for the programmer to implement. Also, for Will Crowther, compass directions might have been the natural choice when he was writing ADVENT because he was a caver who used a compass to map out underground cave systems in real life. As to Wander’s inspiration, as I was writing other games, I got to thinking about the non-deterministic non-linear story experiments I had heard of the French doing in the 1920s, where the reader made choices that determined how the story went. I figured that fairytales like Rapunzel or science fiction like the Retief stories would be a good basis for such stories and computers would be the perfect way to present them, but it would require a great deal of programming skills along with the storytelling skills. So Wander was an experiment to see if the programming part could be made easier by pre-coding the common kinds of actions and consequences. I had the vague idea that I could make it easy to use and then coax some real authors like Robert Sheckley into writing some wanders. I never got that far, of course. It’s a crying shame that we never got to see the words “A wander by Robert Sheckley” flash up on a computer screen! I’m not sure exactly who the French writers that Peter refers to are. Raymond Queneau has been suggested for Un Conte À Votre Façon (1967), but that arrived several decades after the period indicated by Peter. If you have any other suggestions, please let me know. I really have no right to take credit for this, because although I must have read about Wander in the Inform Designer’s Manual some years ago, it only really registered with me after I saw a list of lost mainframe games in Jason Dyer’s recent blogpost. But Wander was more than that because it seems to have been designed to be a tool to allow users to create “non-deterministic fantasy stories” of their own. So perhaps it would be more accurate to say that Wander was in fact the earliest known precursor to modern interactive-fiction development-systems like Inform 7! Wander was thought to be lost, presumably languishing on one or more of the slowly decaying tape-reels of mainframe history. But Jason’s description of Wander on his blog was so intriguing, and the thought that there might still be a chance of finding it again was so tantalising, that I felt I just had to try to get in touch with the original author and programmer, Peter Langston – which proved to be remarkably easy to do. A few emails later, and Peter, who is incredibly obliging, sent me a file named “Wander.tgz”, which contained source code and documentation for a 1980s release of Wander, which he had extracted from archived emails and then massaged into a form that would be usable today. You have been sent to Aldebaran III where you are to avert an uprising against Terran nationals expected at the end of April. During your trip you were able to peruse the ship’s meager library and make a few notes on the history, life-forms and society of Aldebaran III, but much of Aldebaran culture is still a mystery. It is the middle of the night; the ship on which you arrived has just departed from the small spaceport which you find to be windy and deserted. You’re in the Aldebaran III spaceport. An electrified chain link fence surrounds the area with gates leading west and south. There is a credit card here. Your account has 50 credits left. (You can type balance any time to find current status). Your account holds 50 credits. You are in the tiny waiting room for the spaceport. No one is around. There is a large vending machine here with a dark window, several buttons, and a large slot marked “insert credit card here”. That would only help if the machine was broken, and it’s not! I’m no expert on C programming or indeed on interactive fiction, so I’m still trying to work my way through the code and the documentation that Peter sent me, but I think I can say without hesitation that this has all been a completely astounding and wonderful turn of events. Many, many thanks to Peter and Jason for allowing me to be part of a rather historic moment. 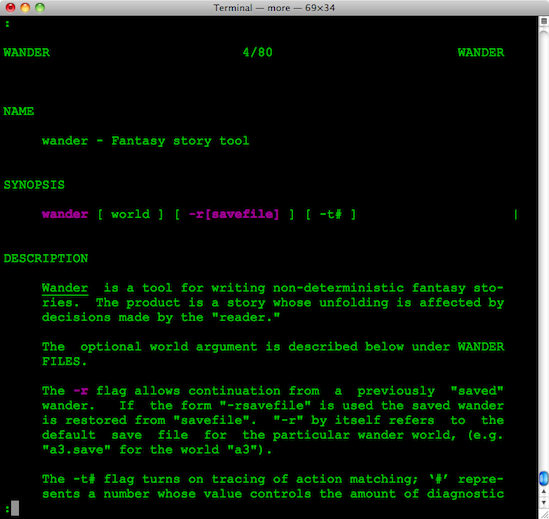 Quotation from the file “Wander.txt”, the man page for Wander, sent to me by Peter Langston with the source code.